Slow Cooker Stuffed Chicken and Potatoes is a simple and delicious recipe for a nearly complete meal from your slow cooker. 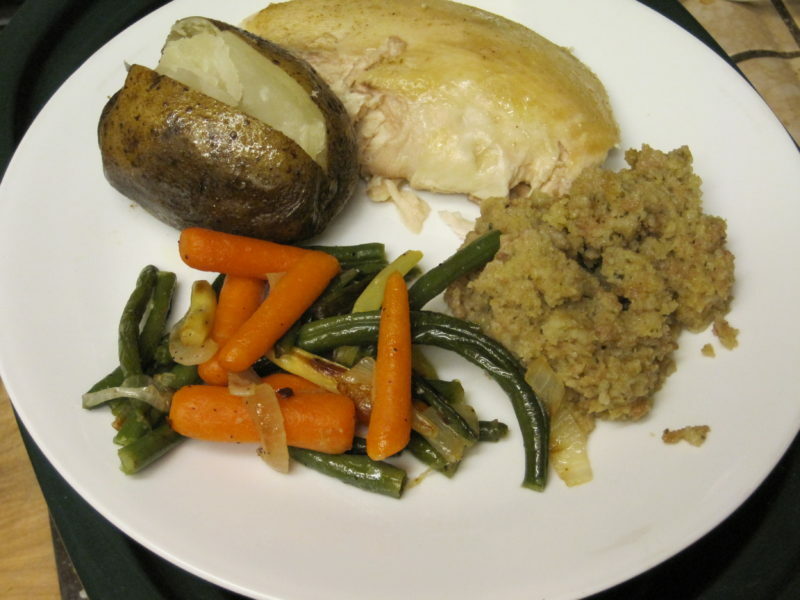 A chicken is stuffed and “roasted” in the slow cooker atop a bed of russet potatoes. 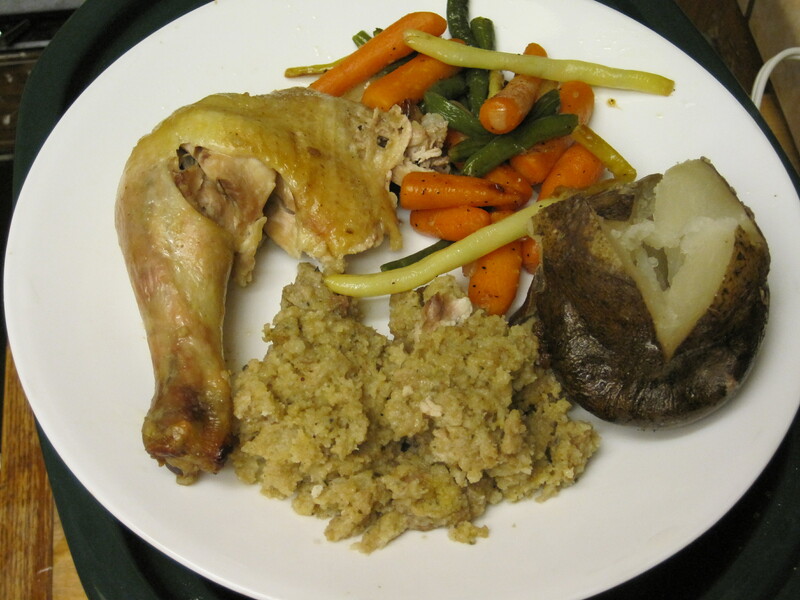 The end result is chicken, stuffing, and baked potatoes that are cooked while you’re at work. All you need to do when you come home is cook a vegetable or throw together a salad. Slow Cooker Stuffed Chicken and Potatoes allows you to have a fancy Sunday Dinner on a weeknight. 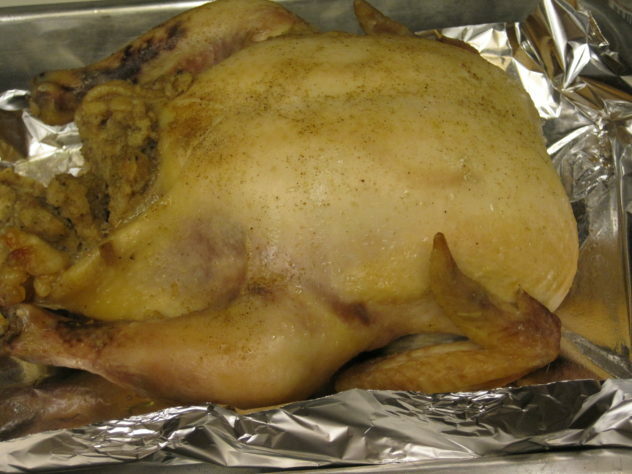 I have been thinking about this recipe idea since before I posted my recipe for “Roasted” Chicken from the Slow Cooker. I kept wondering if there was a way to cook a stuffed chicken in the slow cooker. I finally decided that if I can roast a stuffed turkey in a counter top roaster, a stuffed chicken in the slow cooker ought to be easy. When I published my recipe for “Roasted” Chicken from the Slow Cooker, I showed how much liquid the chicken releases during the cooking process. When I roast my turkey in the roaster oven, it is raised above the pan drippings by a roasting rack, but I didn’t have one that would fit in my slow cooker. One website recommended rolling up balls of foil and placing the chicken on top , but I had a better idea. I used russet potatoes. My reason for using potatoes was simple. I was out of foil, and I knew that you can “bake” potatoes in the slow cooker. My thinking was also along the lines of “Why should I waste money on something I’m just going to throw away when I can use something else that will be useful? 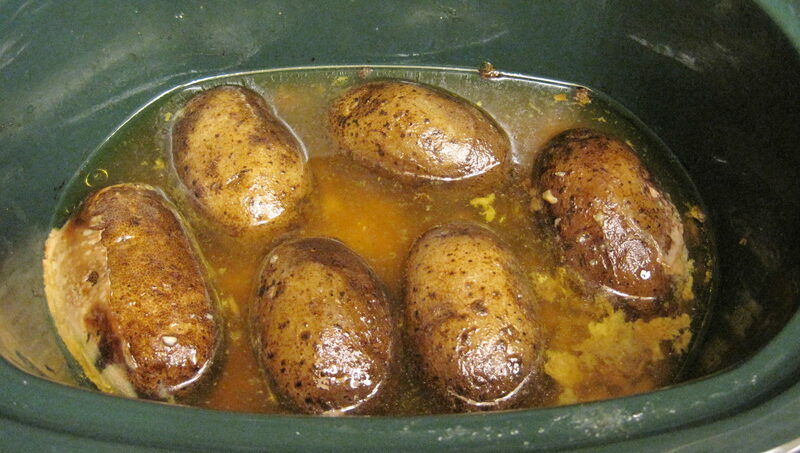 I layered 6 potatoes into my 6 quart oval slow cooker. Then, I turned my attention to the chicken. I patted it dry and spread butter on the outside and inside of the bird and seasoned it liberally with seasoned salt. I also cooked a package of cornbread stuffing. I put the stuffing in the refrigerator, along with the chicken, and went to bed. In the morning, I placed the chicken on top of the potatoes in the slow cooker. I added a raw egg to the prepared stuffing, and using my hands, I mixed it until it was thoroughly incorporated into the stuffing. The stuffing was then placed into the cavity of the chicken. Once everything was ready, the lid was placed on the slow cooker, and it was turned to low. I left for work. Ten hours later, I returned to the house and removed the chicken from the slow cooker. I placed it into a pan, and put it into the oven under the broiler for 10 minutes. This helps to brown the skin on the chicken. While the chicken browned, I cooked some green and yellow beans with baby carrots. I removed the potatoes from the liquid that’s in the slow cooker. As the chicken cooks, it releases a lot of juices. These make great gravy and are delicious added to soup. If you want, you can add 2 tablespoons of corn starch to the pan, and turn it to high while the chicken browns under the broiler. This will make some delicious gravy, but we opted to save the juices to add to chicken soup. Our dinner of stuffed chicken with “baked” potatoes was ready. It was delicious with our vegetables, and it was very easy. A dinner of stuffed chicken and all of the trimmings are possible on a busy weeknight thanks to the slow cooker. Give our recipe for Slow Cooker Stuffed Chicken and Potatoes a try and let us know what you think by leaving a comment below. A well-seasoned and stuffed chicken is cooked all day on a base of potatoes. All that's needed for a complete meal is the addition of a vegetable or a salad. Cook's Note: This can be partially prepared the night before. Place chicken on top of potatoes in slow cooker. 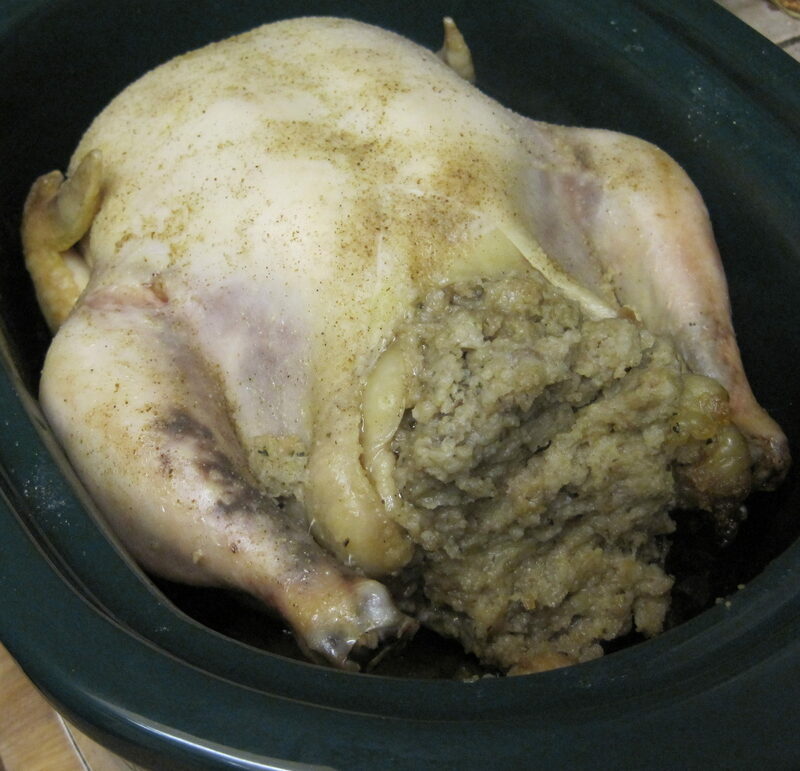 Cover, and place crock in refrigerator overnight along with the prepared stuffing. In the morning, add the egg to the stuffing, Place stuffing into the chicken's cavity, and turn slow cooker to low. 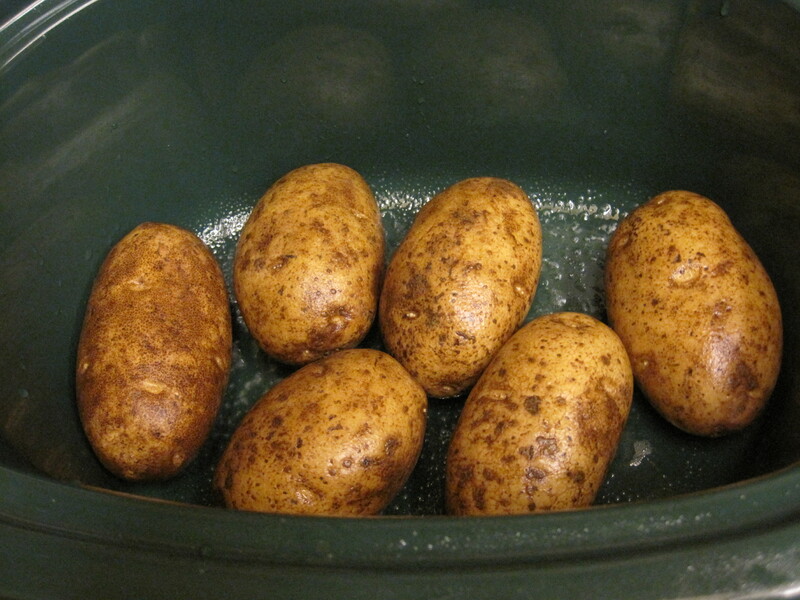 Wash potatoes well and arrange them in the bottom of your oval shaped slow cooker. Remove giblets from chicken and pat chicken dry. Sprinkle inside of chicken with ¼ to ½ teaspoon seasoned salt. Melt butter and brush over outside of the chicken. Rub remaining seasoned salt over the outside of the the chicken, covering all surfaces. Mix cold stuffing mix with egg, stirring until egg is thoroughly incorporated. Fill cavity of chicken with stuffing mixture. Place lid on slow cooker and turn to low. Allow to cook for 10 -12 hours or until chicken is cooked. (165 degrees F at the thickest part of the thigh). Chicken can be served st this point, but if you want your chicken to have crispier skin, place under the broiler for 10 minutes. If your broiler can't accommodate a whole chicken, you can place the chicken into your oven set to it's highest temperature for 15 - 20 minutes. This will brown the chicken and make the skin crispy. Remove potatoes from the liquid released by the chicken and serve alongside chicken. If you want to make gravy from the liquid in the pan, turn slow cooker to high. Add 2 tablespoons corn starch to 2 tablespoons cold water. Mix well, then stir into broth in pan. Turn slow cooker to high, and allow to cook for 20 minutes until thickened. If you don't want gravy, save the liquid and use it in chicken soup.